I love solving family mysteries! I think I may have missed my calling as a researcher. Most people enjoy hobbies like golfing or watercolor painting to pass their free time. I love spending my spare time staring at old microfiche machines, puzzling over old, forgotten photos and slogging through cemeteries, hot on the trail of a story that's been lost to the passage of time. A few of the mysteries I've solved are listed in earlier blogs: here, here and here. Another mystery I've solved started with the photo below. Hopefully, through the miracle of search engines and the world wide web, I'll be able to help someone out there who has been trying since (at least) 1999 to locate the grave of a lost relative. When I first saw the photo above I was about 16 years old. What struck me the most about the image is that the only woman in the photo is the widow, dressed up in her veil and black dress. The rest of people in the photo are either men or boys... and all the boys are holding axes!! What the heck is going on here? The photo looked to be taken sometime in late 1800s or early 1900s. The widowed woman with her three sons standing next to her didn't fit with anybody in my genealogy during that time period (that I knew of) ... so who are these people and why was this picture in with my family photos? My aunt, who originally owned the photo, didn't have an answer, either. She just inherited the photo and kept it neatly in her files. Last year I decided to solve the mystery of this photo. 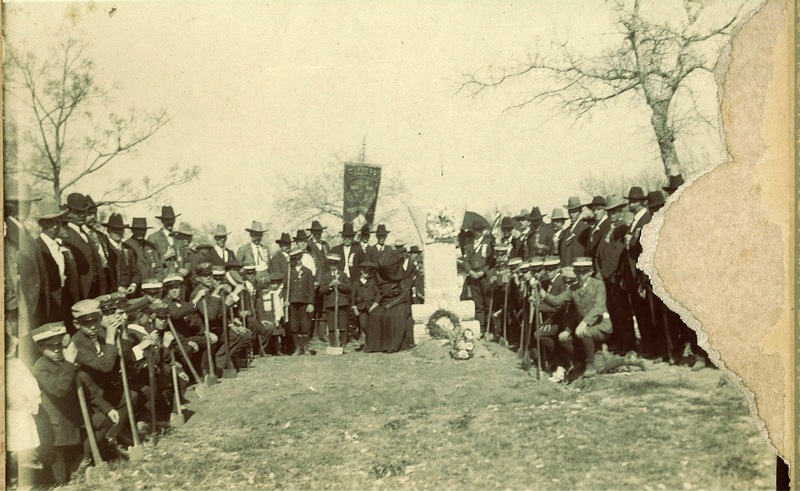 Considering the time frame of this photo and knowing that it was a local photo, I decided to start looking in the Glen Rest Cemetery, which is where most of my Kerrville ancestors are laid to rest, to locate the grave marker. I did a lot of walking.... A LOT.... around the cemetery, only to discover that this particular grave stone is located a few feet away from the graves of my great-grandparents, my grandfather and several aunts and uncles! It was closer to the highway than my family plot and the view was obscured by a couple of other stones and a big, gnarled tree - but I finally found it. "His many virtues form the noblest monument to his memory. Katie. Tis hard to break the tender cord when love has bound the heart. Tis hard, oh so hard, to speak the words, must we forever part? Dearest loved one we have laid in the peaceful grave's embrace but thy memory will be cherished til we see they heavenly face. Wife and Sons." His wife, Katie, wrote the first part of the inscription and then she and their sons wrote the poem together. If their words are any indication, JW Busby was loved deeply by his family. So who was JW Busby? Why did my family keep a photo of his memorial service for all these years? JW Busby, while attending to a sick horse on Thursday the 16th last was kicked in the stomach by the animal and died just a week later. At first Mr. Busby was not thought to be dangerously hurt, but it was discovered later that his liver was crushed and hmorrhages set in and lasted until the last and he also suffered intense pain. Mr. Busby came to Kerrville about six months ago with his wife, three little boys and mother from Memphis, Tennessee and had just recently engaged in the real estate business in this city. Mr. Busby was a member of Memphis Camp W.O.W. and the funeral services were conducted under the auspices of that body. He was buried at Glen Rest Cemetery, this city, Friday at 5 pm. During his short stay in our midst Mr. Busby made many friends. The Sun extends to the bereaved ones its sympathin in their hour of trouble. What a sad story! Six months after coming to a new home, he has a painful accident and dies, leaving a wife, mother and three kids behind! 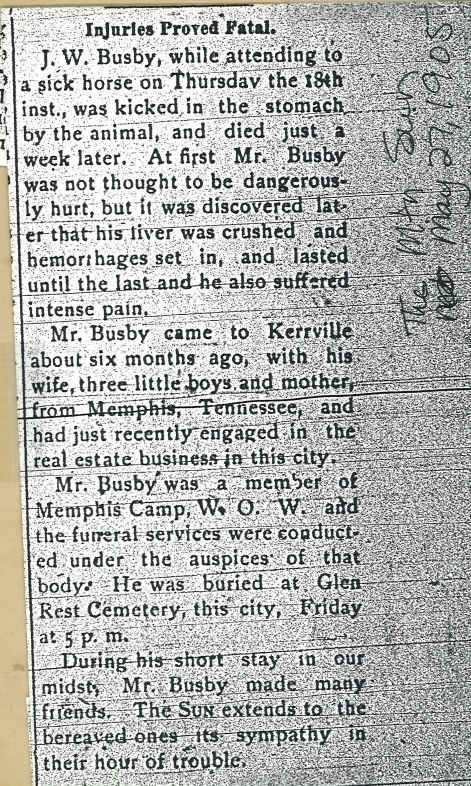 I also found an advertisement in an earlier copy of the Kerrville Mountain Sun for Mr. Busby's business.... but still no clue on why a photo of his funeral would end up in my family photos! 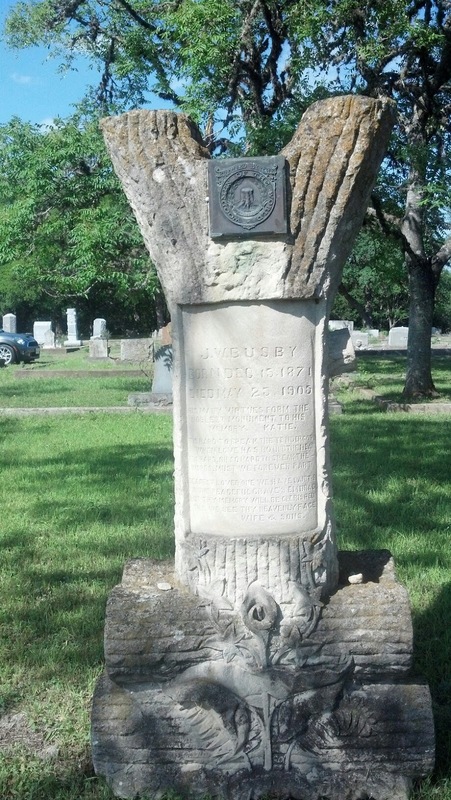 When I told my mom that I had found the grave in the photo in Glenn Rest Cemetery and the name on the stone she said she remembered a man by the name of Thelma Busby coming to Kerrville when she was a child and that she was told he was a cousin on her father's side. Luckily, the Council family lineage is well documented with more than one publication devoted to its genealogy. I dug out one of the old books, went back a few generations in my branch of the family tree and found a Busby! 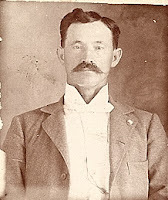 My great-great grandfather, Henderson Council, had a brother, William Council. They were the two youngest boys in a large family. William Council had a daughter, Penny. Penny Council married a James Busby and they had three children, one of them was John W. Busby - the man buried in Glen Rest Cemetery! 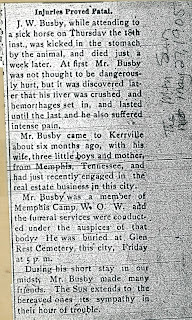 This is a long shot, but I am looking for the grave of John William Busby d. 1905 in either Brownsville, Texas, Memphis TN or Hernando, MS. Family history is that he has a Woodmen of the World totem grave marker, but we can't find where he died! John William was born 1873 in Desoto County, Mississippi, married Katie May White. The Woodmen confirmed he joined in 1899 in Memphis and died in 1905. This post helped to put a few more puzzle pieces in place. 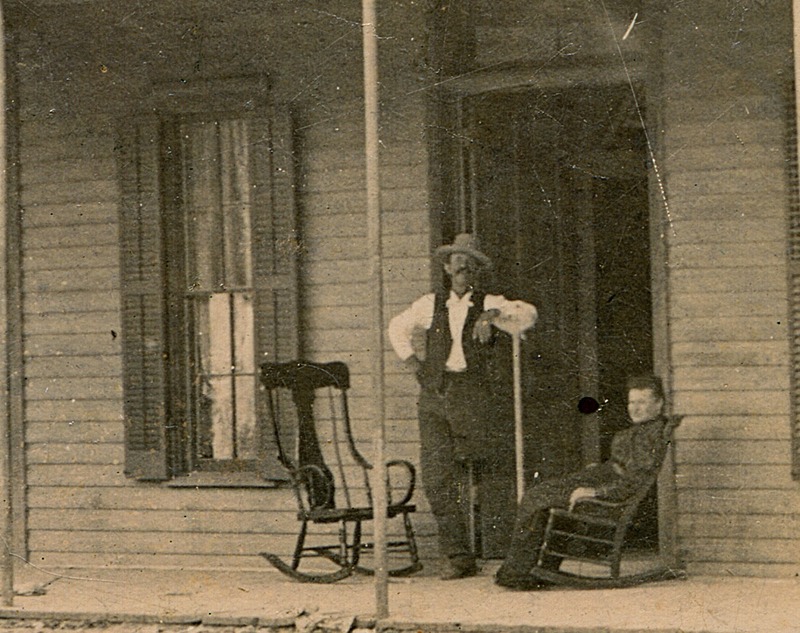 After the civil war, my great grandfather, relocated from Chatham County, North Carolina to Hernando, Mississippi. My grandfather was born in Hernando in 1875, a couple of years after JW Busby, so they were probably good friends since they were close in age and second cousins. The living was hard in Mississippi for my ancestors (My g-grandfather eeked out an existance by robbing bees and selling honey to the city folks in Memphis, TN) and my great grandfather moved his family to Kerr County in 1890, where they eventually prospered. My guess is that the Thelma Busby my mom remembers from her childhood was one of JW's three sons. I think Thelma lived in Kerrville for a short time, but eventually moved away. My friend, Deborah Gaudier, who is another local history researcher, was inspired to do further digging on the Busby family and learned a few more tidbits about them. Thanks to Deborah, we now know the names of all three sons in the picture, and have confirmed that the Thelma Busby my mom remembers is indeed JW's son. The story takes another twist with the 1920 Census. After JW's death, Katie moved north.... my guess is that the railroad jobs that William and Thelma held took the family to Chicago. I would love to know where the family was between 1905 and 1920. It does seem like Katie had a life-changing event in Missouri in 1908, I'll let you all figure out why. John Arthur Busby WWII Draft Registration "Old Man's Draft"
The Curse of the Groundhog!! I haven't written here in a while and decided it's beyond time to break my silence. Since I was doing a bit of research for Keri Wilt over at GrapeJuice about Kerrville's lone ground hog, I thought I'd share the story here, too. In August of 1935, several residents near downtown Kerrville reported a strange creature roaming yards and creating havoc – damaging gardens, committing “petty thievery” and “outright defiance of the body social.” One newspaper article even referred to the creature as Kerr’s Public Enemy #1. When the strange creature was caught, it was discovered to be a groundhog – definitely NOT a Kerr County native. Nobody could figure out how the animal got here. Visitors lined up to view the groundhog in his cage and wonder at his presence in our town. 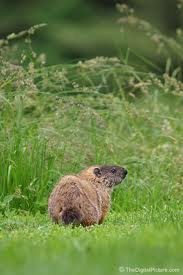 They named him “Tony Woodchuck” and he lived in captivity in the Council yard on Jefferson Street for about two weeks. For a long time, this is where I thought the story ended until this week when I came across a later article in The Kerrville Mountain Sun about the sad fate of Tony Woodchuck. Unfortunately, the animal escaped from his cage and an “outraged mob of Kerrville dogs broke loose and lynched Tony for his high crimes.” After Tony’s horrible demise, it was revealed that Tony belonged to Mrs. Elsie Harris. Mrs. Harris had brought Tony back from a trip to Tennessee earlier in the year as a kind of souvenir. The strange punchline to this story is that my grandfather died 15 years later, on Groundhog Day!! Joe Herring, Jr., a friend, fellow "history geek" and local columnist wrote about how Kerrville has celebrated the Fourth of July over the years. 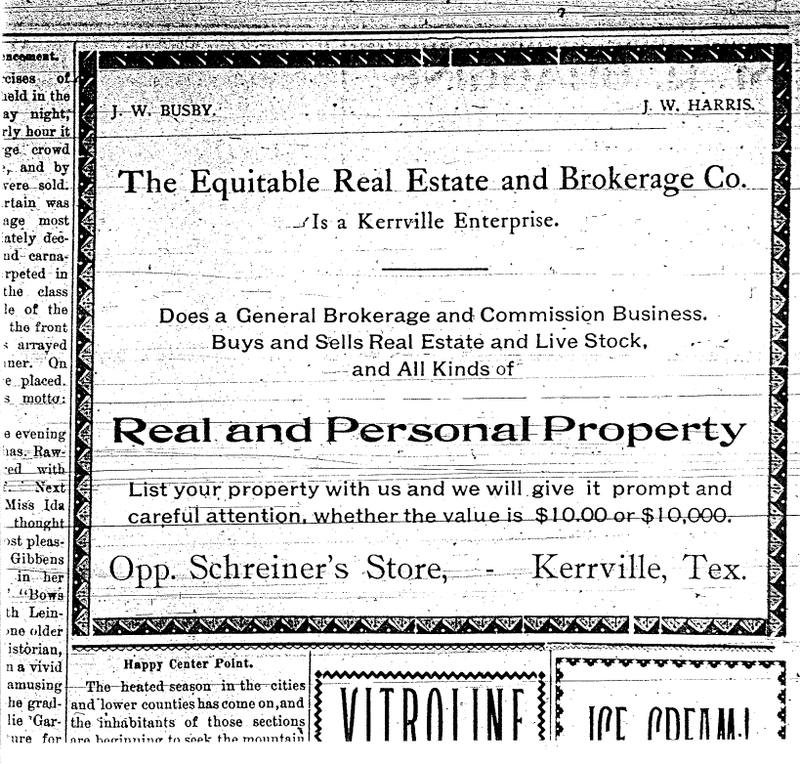 In last weekend's edition of the Daily Times he wrote, "In 1902, Kerrville enjoyed a grand celebration at the Kerrville Park, which I think was the old West Texas Fairgrounds." He went on to talk about the festivities that day. Someone had written "July 4 Barbecue" on the back of the photo. The short couple on the far right are my grandfather, William Lanza Council and his first wife, Leah Steagall Council. I don't know who the other people in this photo are, but would love to know. This is a photo that's fun to study, from the pouch hanging on one of the ladies' belts to all the stuff going on in the background. There's lots of fun stuff to see. Looks like a a barbecue! When I read Joe's column this week I couldn't help but wonder if this was taken at the 1902 celebration. 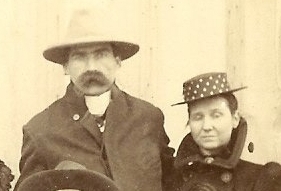 My grandfather and Leah were married in 1900. This is before their daughter was born in 1907. My guess is this photo was taken sometime between 1901 and 1905 - so the chances are pretty good. 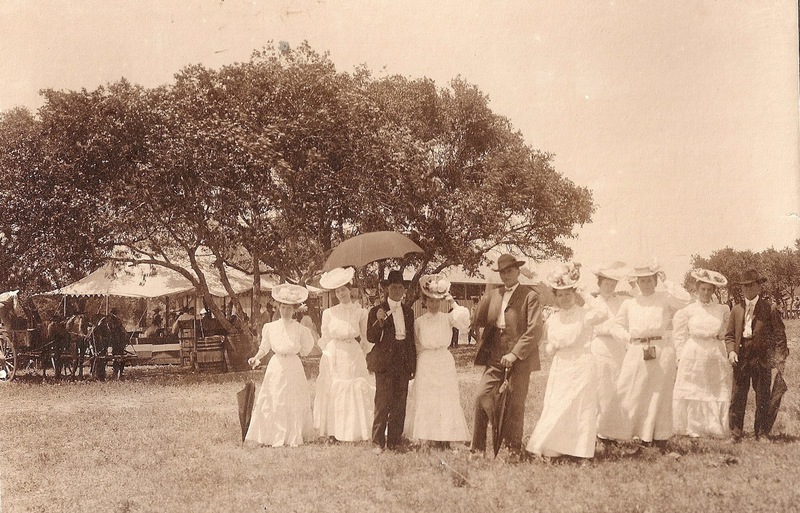 According to Joe, the 1902 celebration featured a foot race, sack race, high jump, ladies' foot race, greasy pole climbing, wheel barrow race, barbecue, speeches, basketball game and many other activities. 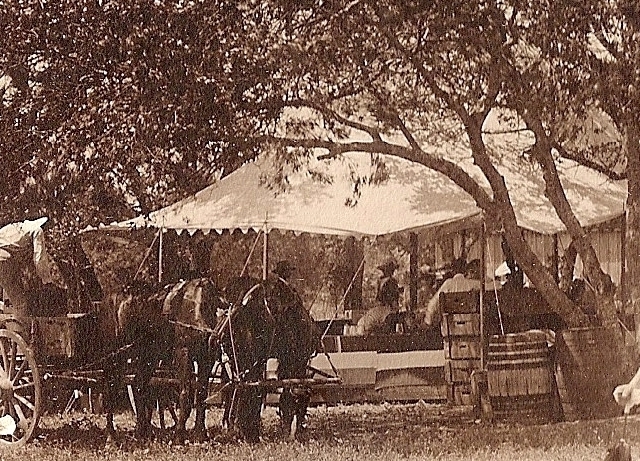 Today's Fourth of July celebrations look very different from those over a hundred years ago. While I am known to wax nostalgic for days gone by, I am so glad those long white dresses and big hats are no longer considered proper summer attire for Kerrville ladies! 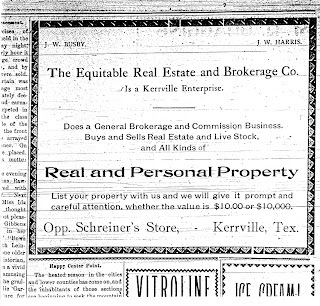 A Lost Chapter of Kerrville History - FOUND! 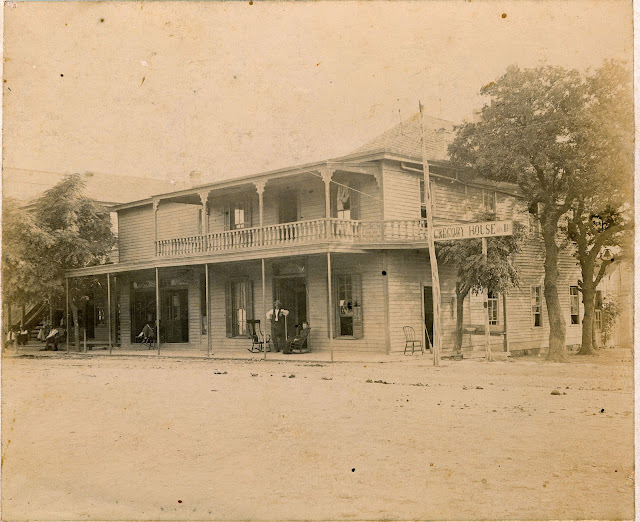 ﻿﻿Through our shared interests we have been able to identify unknown individuals in our family photo collections, learned about the lives of these two families and brought a forgotten image of downtown Kerrville back into the public eye. The story I am about to tell you is about one of Dana's relatives, William V. Gregory, an early Kerrville resident who helped shape our town but has been (literally) lost in the annals of local history. The pictures in this blog come from both our collections and if we hadn't been working together, neither of us would have known the treasures we each held. ﻿﻿﻿﻿﻿﻿﻿﻿﻿﻿﻿﻿﻿﻿﻿﻿﻿﻿William Vandyke Gregory (December 12, 1846 - January 29, 1931) was 29 years old in 1875 when he left his native home in Marshall County, Tennessee and moved to Kerrville. Within the first three to five years of his residency here, William proved his entrepreneurial spirit: He established a shoe shop, a hotel called The Gregory House and had a horse trading business as a sideline. In October, 1878 Mr. Gregory was a witness to the aftermath of the Dowdy Family Massacre, one of the last known Indian raids in Kerr County. He was a family friend of the Dowdy's and was riding to the family's home on Johnson Creek for a visit. He was two miles south of the Dowdy home when he learned of the attack. Gregory raced to the scene and arrived as the bodies of the Dowdy children were laid before the family. His account of the tragedy was published in the October 7, 1878 issue of the San Antonio Express. "Alice lived long enough to recognize her mother - spoke the dear name of 'Mama,' and expired." His account said. 1880 was the year that changed Mr. Gregory's life. He injured his left knee while working and it became so infected that the leg had to be amputated. The amputation was performed by four doctors, Drs. White, Nowlin, and Harwell from Kerrville and one other [un-named] physician from Comfort. The operation took place in the home of Joe Robinson, a "little residence situated in the southeast corner of the Starkey Farm." Joe Robinson's sister-in-law, Julia Kernodle (August 1851 - Nov. 6, 1930), another 1875 transplant from Tennessee, lived in the home and helped take care of Mr. Gregory. As Julia nursed William back to health, love bloomed and they were married later that year. After the couple's marriage in 1880, Mr. Gregory's hotel gained a second story and they eventually branched into the mercantile business. In studying the photo above of the Gregory House hotel, rooms were $1 a day and meals $.25 per day. Sometime around 1900 the property was sold to J.L. Pampell and the building became a confectionary. After their retirement from the hotel and mercantile business, William and Julia built a home on a 20 acre plot of land in the southeast corner of the D.A. Rees tract and raised chicken and dairy stock. In the early 1920s the Gregorys sold this farm and built a home in the Lowry addition. On Thursday, Nov. 6, 1930, Julia died of a sudden heart attack at the age of 81. Her obituary in the Daily Times read, " On Tuesday, Nov. 4, at the general election, she accompanied her husband to the polls and cast her ballot. The election officers and others remarked concerning her apparent good health, giving promise of more years of life. Thursday morning she was stricken with heart trouble and passed away about nightfall." William died only three months after his "beloved" Julia's passing, on January 29, 1931. In his obituary, the Kerrville Times said, "He had very little education but was energetic, a keen trader and succeeded better than many men with two legs to walk upon. He was of a kindly and peacable nature and had many friends." A sad footnote to this tale: While William's obituary says that he and Julia are lying side by side in Glen Rest Cemetery, due to an unfortunate series of circumstances, the location of their graves has been lost and cannot be located. After searching for old church registries, courthouse records and talking to numerous cemetery and funeral home personnel, I am still hoping for a miracle that will one day point me to their final resting place. Mr. Gregory's name is also mis-spelled on the Pampell Building's historical marker. It has been a lot of fun researching William and Julia Gregory with Dana and I would like to thank him for his generosity in sharing the fantastic image of the Gregory House Hotel with us. It is an amazing photo! Who would have guessed the Pampell's building ever looked like that? It's been a fun ride and I've learned along the way! I have recently been told that I made a classic mistake that many budding bicycle enthusiasts make when getting into bikes. This is an opinion shared by many internet cycling gurus. Even though I admit those "in the know" have a point, I don't regret my "mistake" because it was fun in the making and the past year has been one of growth and learning. The mistake was purchasing my beloved Nora, the 1963 bicycle I bought and rebuilt, almost a year ago. Back then I had stars in my eyes and only had my childhood experiences and love of old things as a guide as to what to look for in a transportation cycle. In all fairness to myself, I just wanted to get back on the bike and didn't want to invest a lot of money in case my return to the pedals was short lived. 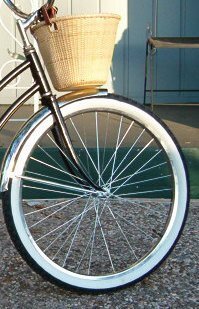 I enjoyed riding Nora when I first started cycling to work and still love that bike, but I realized how hard I was making it on myself when a generous friend gave me a 21 Speed Schwinn Suburban. After fixing the gearing and making some upgrades to the bike (racks, fenders, etc.) the Schwinn became my bike of choice for basic transportation. The Schwinn (aka Marina) was lighter than Nora, I had better balance on the Schwinn and the gearing on the bike made it easier to climb hills. I also didn't know enough about bikes to know that Nora's frame was bent and as a result is a lot harder to keep balanced. Even though Marina has 21 speeds to choose from, I realized that I only use about four of the different gear selections in my commutes around town and even though she's a lot lighter than Nora, she's still a very heavy steel bike. Before long I started reading blogs by other bike enthusiasts like Lovely Bicycle and Rideblog and learned more about different types of bicycles and cyclists. 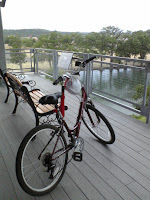 I read about the experiences of other cyclists out there and the various bikes available. There's a bike for every personality and journey and the selections are as varied as snowflakes. Before long, I was dreaming of British bicycles and the bikes that caught my eye the most were the Pashley Princess Sovereign and the classic Raleigh Sport 3-Speed. I felt both bikes would suit my needs commuting around town and running errands. The Pashley Princess runs about $1200 retail and a good Raleigh Sport can be found on Craigslist for around $150-200 (which is high, but they're harder to find in Texas than on the East Coast). 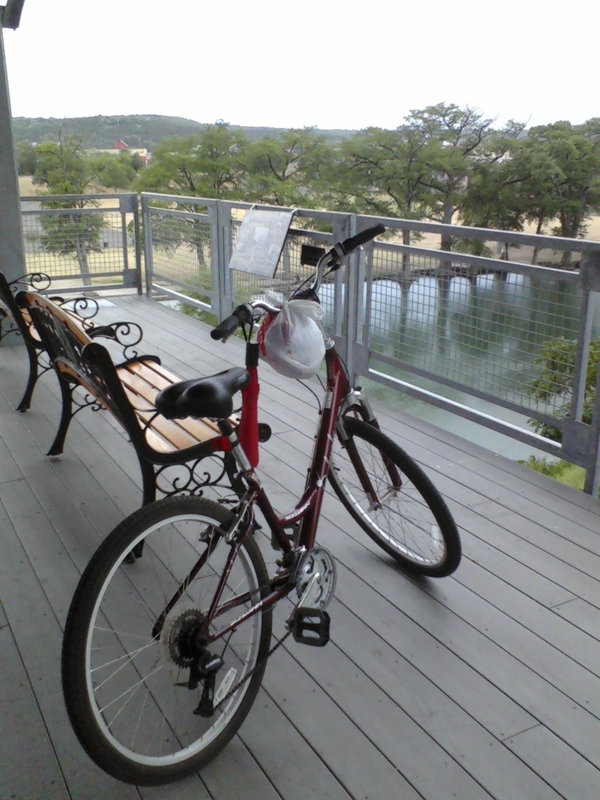 After doing research on both types of bikes, I learned that the Pashley is much heavier and harder to get up hills than the classic Raleigh (and I live in the Hill Country!) ... not to mention that the price of an old Raleigh fits into my budget better than a Pashley! So I started looking for a vintage Raleigh Sport, circa 1969-1978. I dreamt of finding a green Raleigh because 1. green is my favorite color and 2. the one that Velouria at Lovely Bike used to own was gorgeous! For months I have been pouring over ads on Craigslist, drooling over Raleigh photos on the web and eyeing my husband's 1972 Raleigh with serious bike envy. This past week I found my dream bike - a green 1971 Ladies' Sport! I have named her "Lilly" and my husband and I are currently working on her to make her road-ready for the miles ahead. There are a few condition issues: She needs a new saddle, there's a bad rust spot on the front fork and the gearing needs some work. All in all, she's a beauty: The Sturmey Archer shifter looks brand-new, the chrome is immaculate and I am fascinated by the branding that adorns the bike. The folks in Nottingham, England sure were proud of that Heron logo - it's everywhere! I haven't had a chance to ride Lilly yet, but I am already amazed at the lightness of her lugged steel frame and how well she fits my own frame. More updates to come as we get to know each other better! my husband built for his Raleigh! While Nora might not have been the best choice for a budding cyclist, it's the choice I made with the knowledge and skills I had at the time. I still ride Nora, mostly when I am riding with nieces and nephews who are brand-new to the joys of bicycling, and it's still a lot of fun. I have grown in skills and comfort level and the type of cycling I do has changed drastically from when I started this journey a year ago. I doubt Lily is the last bike I buy (although finding a place to store five bicycles is getting to be a challenge) but she's the bicycle I've dreamt of riding for several months and I am going to enjoy falling in love all over again! At last! His and Hers Raleighs: ready for a ride into the sunset! 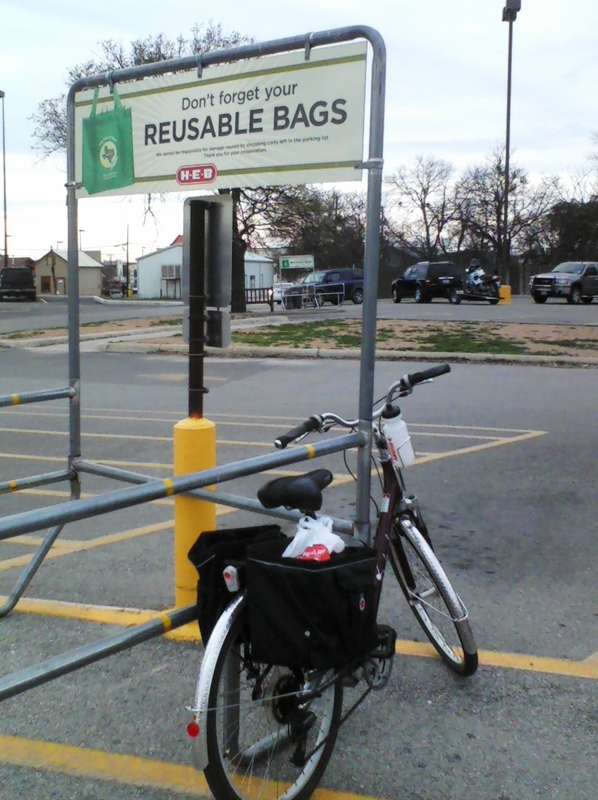 My commuter bike, "Marina" at the grocery store. The place needs bicycle racks!! When 2012 rolled around I made a few resolutions. One of those resolutions was to get serious about commuting to work on a bike more than I drive the car. This week I can honestly say I am a bicycle commuter. As you can see in the photo at the left, I have equipped my commuter bike with a set of fenders, a rear rack and panniers (the bags on the back) to make it a more practical ride to work. Today was my first big trip to the grocery store. The panniers easily detach from the rear rack and have a shoulder strap so I can carry them into the grocery store and use them as shopping bags! Pretty cool, eh? This week I cycled into work all but one day. The day I drove was a day I was scheduled to be at work until after 8 pm. A good headlight for the bike is the next big ticket item on my wish lish so I can bike after dark if I want to! In other news: Both my nieces, Claire and Scarlett, have recently said goodbye to training wheels! I can't be more proud!! The number of cyclists in my family is growing and I am eagerly awaiting the first ride with my cycling siblings, nephews and nieces! I'm inspired to put together a cycle-themed family gathering soon!! "A Joyful Heart" is the latest creation to come out of my studio. This is something I dreamed up a while back but it took awhile to make the dream a reality. First I had to make a sketch so my husband could make the stickman. 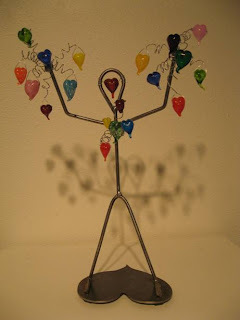 Then I had to decide on what colors to use and make all the hollow glass hearts and then came the real challenge.... trying to figure out how to attach the hearts to the stickman! I entered this sculpture into a judged art show at work and while it didn't win any awards I am still proud of myself for being brave enough to enter a judged exhibit. It's also a big deal because I've been blocked artistically for over a year and it really got bad this summer. It's like everything just shut down and it was a tedious chore to work in the studio. The block made it very hard to write blogs as well. How did I get through the block, you ask? Well I enrolled in an Artist's Way group, it's like a 12-step program for blocked creatives. The group has been a very powerful experience for me both spiritually and creatively and I am so glad I joined up. So I decided, as they say in "The Princess Bride," to go back to the beginning. I started working with beginner techniques and basics and decided to just have fun with the process. When I approached the studio I refused to put any expectations on my work. I was there to have fun and create - nothing else. I even used expensive glasses and tools I had been hoarding for when I got "really good." I just had fun... and it was one of the best torching sessions I've had in my life. Before I knew it, my kiln was full of little hollow hearts, all in bright, happy colors! I didn't really grasp how big a deal my play session was until I overheard my husband telling my mom that my "playdate" was the first time in a long time he didn't hear curse words or sounds of frustration coming out of my studio. I didn't even realize I had been vocal in the past! I had been taking myself way too seriously and it was holding me back. So from here on out I promise to be nicer to myself and embrace the joy of creating instead of chasing perfection. I truly believe that we are put on this earth to love, create and learn.... in that order. (This is something I read recently and am fully embracing the philosophy.) Being loving means I must be loving to myself as well as others. I can't create if I don't come from a place of love. And I can't learn if I am not willing to make mistakes. Powerful stuff, isn't it?